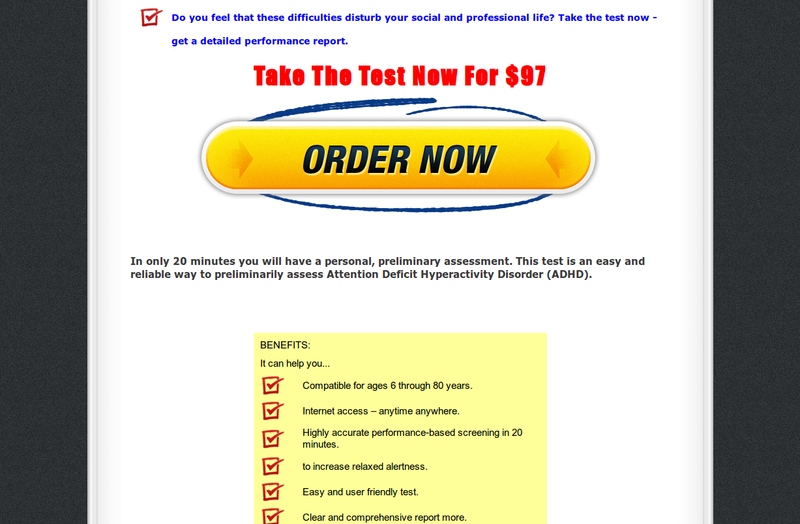 Let's say you are looking for information on adhd testing on the internet. Will this grab your attention and entice you to read the content within the first 5-seconds? The site's header says something about adhd testing, and it's spot on for what you are looking for. If it wasn't there, the headline--the text that's in bold red font fails the 5-second test. While it does offer a benefit to the reader, it's barely readable. This is the copywriter's best effort to get you to continue reading? It's kind'a lame, don't you think? I'd replace that with something that will follow up the benefit offered in the headline... or give the reader a secondary benefit that they stand to gain. A video might be good at this point. This is not just a checklist. 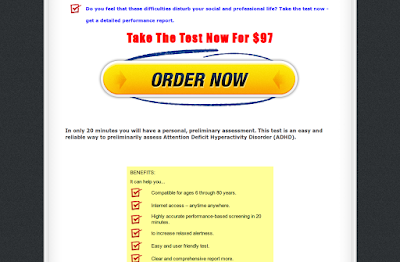 This is the only online performance based test. 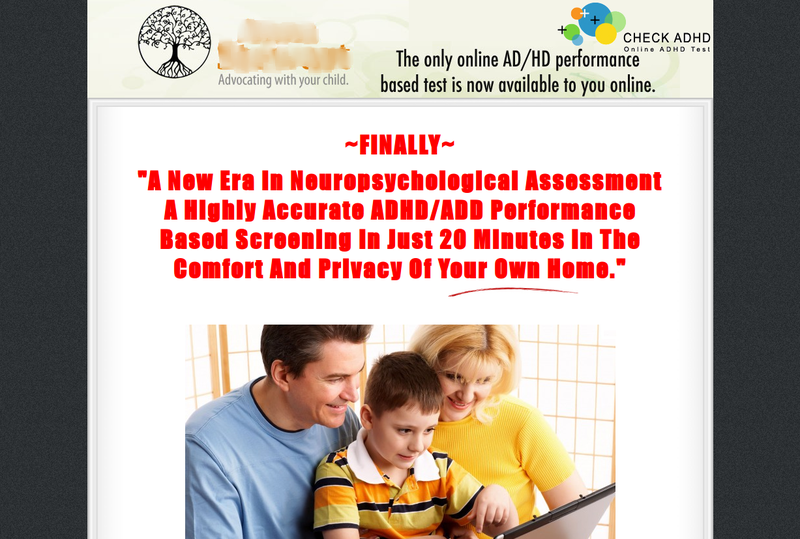 It is reliable, easy and immediate - it is the only online test to preliminarily test for AD/HD - created by leading edge specialists in the field. 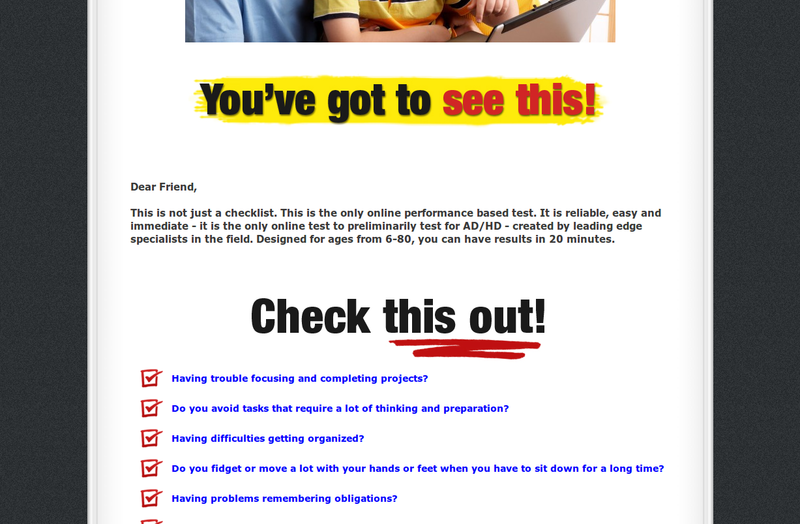 Designed for ages from 6-80, you can have results in 20 minutes. I just don't get why the copywriter followed that up with... "Check this out!" In my opinion, the copywriter did not do his/her homework. Copywriter must have seen the material provided by the client and decided that eye-catching graphics and being loud will get the reader to keep on reading. Imagine walking into a car dealership, intending to buy a car. The salesrep that attends to you is obviously drunk and talks loud. This is how this site feels like, doesn't it? 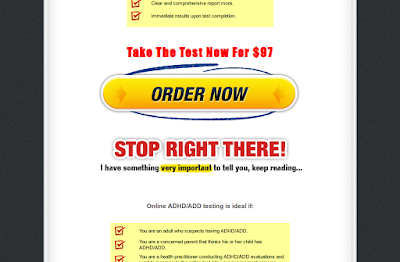 Since you, the reader, are looking for information on adhd testing, you'd probably read some more to see if there is something to be gained here. But at this point, this page is starting to lose its credibility with you, doesn't it? It's starting to read like advertising. Judging from the subject matter, this kind of advertising is not appropos for this particular market. You decide to hit Page Down again. This time though, you've probably decided to go on scan mode--scan for keywords, hoping to find something you are looking for. After giving you a few benefits in bullet list form, the copywriter is now asking you to make a purchase. If you ask me, I'd click on the close button on this page, or go back to google. 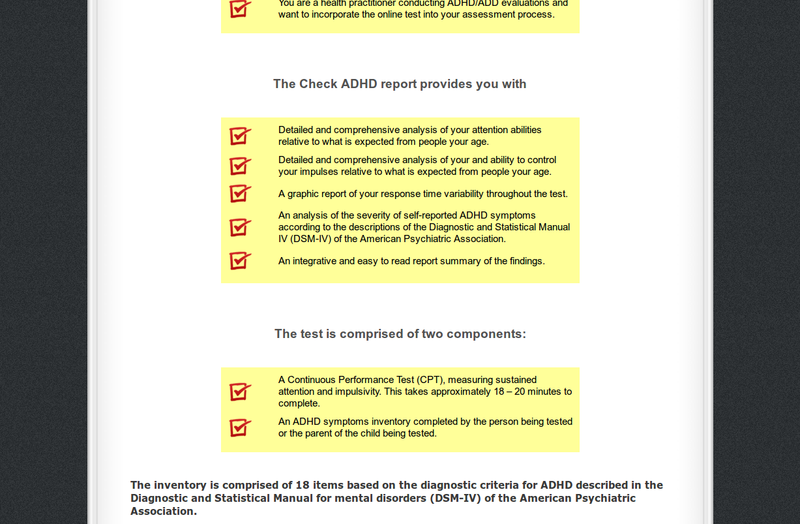 What I would have done differently is to present more facts to the reader that will support my initial claims--that this was an accurate test for adhd, how it is possible to take the test online, reliable, easy and immediate, etc. You can't just state the benefits in a bullet list without giving the reader more information. They want information. They are open to being convinced. 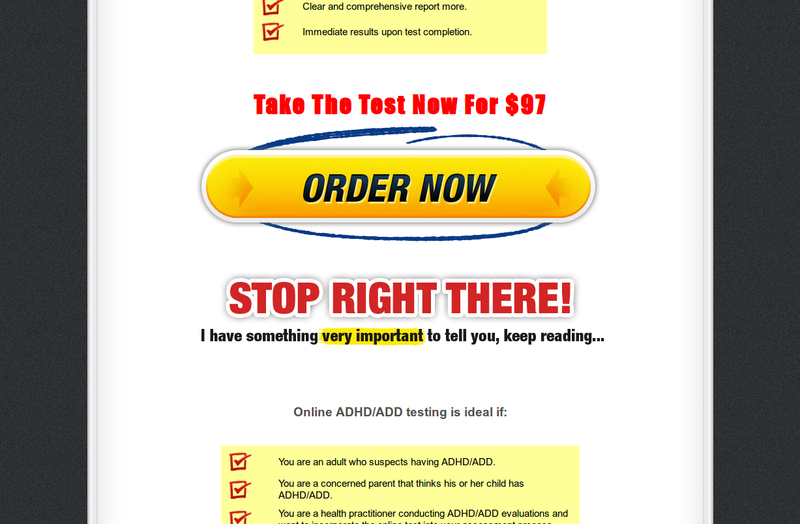 Your readers are looking for a solution... a reliable test for adhd. If you are not going to give it to them, someone else will--and get the sale. At this point, the site would have lost any credibility that's left in it. It is easier for the reader to bounce off this page and go some place else. The copywriter was on to something, but did not put more hours in doing research and giving more information. If you do enough research, the words will flow effortlessly into your page. It will then be easy to tie everything together and get the reader to act as intended. 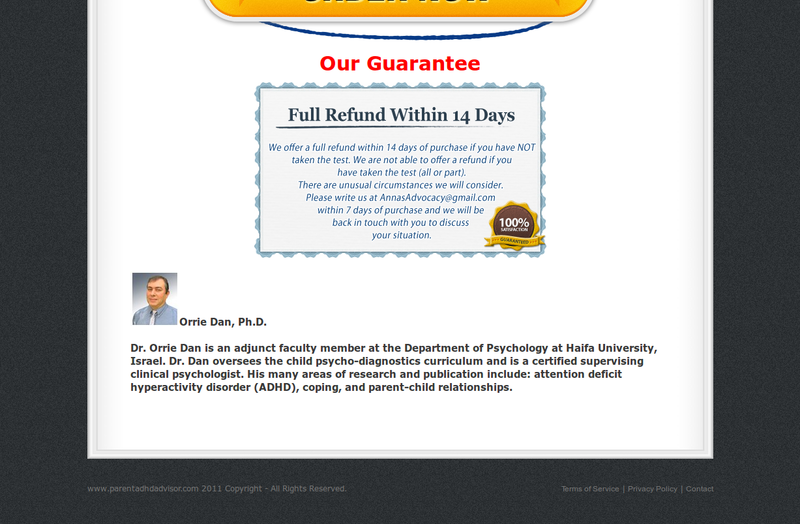 If you presented your case sufficient enough, you will not need a big "Order Now" button. 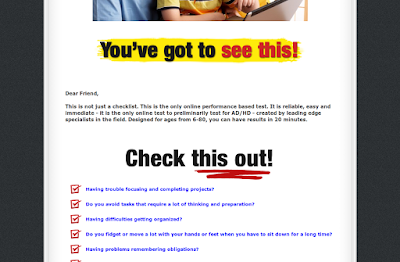 Text that blends in with the copy saying "Click Here to get the test" will more than suffice. I think by now you can see the potential in making good money as a copywriter for internet marketing. Believe me, there's so many "copywriters" like these out there. If you are new in this business and will just present the facts in your copy, you are off to a good start. Soon as I finish rewriting this sales page, I will share the link on this post. Thanks for visiting--Enjoy your day!